The Middle Harbour Sailing Club was formed by a group of VJ enthusiasts led by Barry Wilson and Brian Baker on 22 March 1949, at Adams Boat Shed, The Spit. The first race was held the following Sunday with six boats competing. 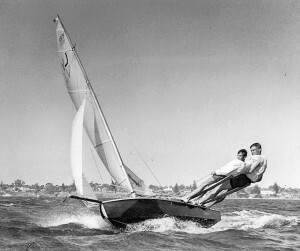 Brian Baker and Brian Wilson were members of the 16 ft Skiff Club at the Spit. B class members sailed VJs and other dinghies and the A class members sailed the 16s. Barry and Brian wanted to join the VJ association. In the early stages the Club was affiliated with the Modified VJ Association and by the start of the 1949-50 season, affiliated with the VJ and VS Amateur Association. The 16 ft skiff club was supportive of the new club and the 16s sailors were generous with their advice for the young VJ sailors. The Inaugural Regatta was held on 18 September 1949 with a handicap race at 10 am and the Wy-ar-gine Cup at 2 pm scratch start. 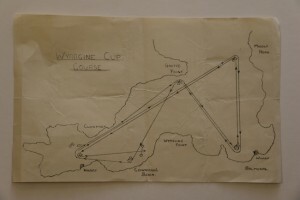 The program shows a full season of races through to 2 April 1950 made possible by the generosity of the residents of Wy-ar-gine point and Chinamans Beach area. The club had the support of many prominent Vice-Presidents (patrons) including Sir Norman Nock, W.N. Hughes MP, P.C. Spender MP, Mark Foy and entertainer Bob Dyer. Office holders included A.H. Baker, President and P.G. Boyce, Commodore. The trustees were B.Wilson (Secretary), B.Baker (Treasurer) and W.Wilson. The first full season closed with 93 members and 44 boats on the register. The second season saw this number increase to 200 members and 52 boats. During the next few years there was a gradual decline in both membership and boat registrations owing to the high cost of building a VJ. During the 1954-55 season a boat building scheme was introduced by Don Fairbrother, then Club Captain, and this brought about an increase in both the number and quality of the boats. The 11ft 6″ Vaucluse Junior, designed in 1931 by Charles Sparrow and Sil Rohuo, was the most popular and numerous sailing boat in Australia. There were fifty VJ clubs in three state zones and MHSC was considered to be one of the premier clubs. 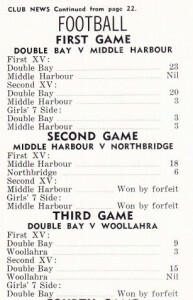 The MHSC, or the Middle Harbour VJ Sailing Club as it was more widely known, was in the Sydney Harbour Pittwater Zone of the VJ & VS Amateur Sailing Association. Club members played a major part in administration of the class at a local and national level. By 1959 club members had won three national championships J.Harnett (J.W II and Fantasy) and B.Holmes (Venture). MHVJSC continued to operate from Adams Boat Shed. The shed was very old and not weatherproof and it was not possible to keep boats and gear under lock and key. The club had no facilities for social gatherings and hired halls as far away as Willoughby for social gatherings. There was no security of tenure at Adams Boat Shed and Mr Adam’s son was contemplating changes. The club needed a permanent secure home and the records show that by 1955 enquiries had been made with the Lands Department to obtain a clubhouse site. In December 1957, club member and solicitor Donald Glasson wrote to the Secretary of the Maritime Service Board. “We act as Honorary Solicitors for the Middle Harbour Sailing Club. The club is open to any boy or girl of good character and training is provided by experience yachtsmen. 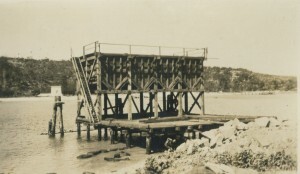 It is now desired by the Club that if possible it obtain a site for a Club house, and for rigging, marshaling loading and general purposes areas, that area of reclaimed land and site of jetty on piles containing about 1 rood 2 and half perches which we understand is present under lease to the Council of Mosman and was originally leased to the Council as a wharf receiving metal from the South Coast. The site referred to lies between the Spit Baths and the Pumping Station of the Metropolitan Water Sewerage and Drainage Board. In 1955 the club finances show a balance of 46 pounds. By 1957, 500 pounds had been raised for a new club house and by 1960 there was 1180 pounds in the building fund and 407 pounds in the general fund. MHVJSC was a very active club. In addition to weekly Sunday racing with morning and afternoon starts, the club held a general meeting each fortnight as well as regular committee meetings. Many of the general meetings were held at Adams Boat Shed, receiving race results from the Starters and Judges, reports from the Launch Manager, registration of new boats, and upcoming events and regattas. Social events included dances, games nights, film nights and winter football matches with other VJ clubs. Planning for the new clubhouse continued. In Sept 1959 letters were received from Mosman Council saying they would demolish the Tar Plant next to the wharf, and from the Electricity Commission advising about their cables near the proposed club house. It was decided that a sail measuring triangle be set out on the new clubhouse floor and all boats racing with the Club should have their sails measured and checked. The VJ sails measuring triangle is still visible on the clubhouse floor. 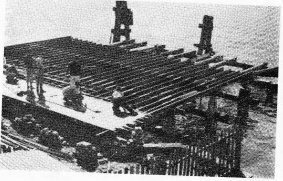 In October 1959 approval was given by the MSB, but with an extensive list of repairs required to the wharf structure, including a requirement that the “floor of the club house should be at a level of 8’6” above the Indian Spring Low Water otherwise the building will be liable to flooding at the 6’ tide”. The first lease was signed in March 1960 in the name of three members as Joint Tenants, Jack Carter, Horace Barnes and George Pollack. The lease included the park next to the clubhouse which was much later declared Crown Land and no longer included in the Club’s lease. F.W. Zemanek was the Club President from May 1957 through to August 1960 and led the club through this formative time in its history. Just prior to the new clubhouse occupation F.W. Zemanek passed the Presidency to H. Barnes and became Club Secretary. The Minute Book and his Secretary’s copies of the club constitution have been preserved and are among our oldest archival material. Building operations started in May 1960. J Jenkins and Sons were contacted at a cost of 110 pounds to remove old piles and gratings. By July new joists and flooring were laid and three phase power was connected. Every adult member was asked to contribute labour of one day a month to help the skilled workers. By November 1960 the sewer had been connected, bricks laid to carry the concrete floors and plans drawn for steel trusses to carry the roof. With funds now short, President H. Barnes reported to the General Meeting on 23 January 1961 that a temporary roof had been installed. Two members were delegated to apply for a bank loan of 1,000 pounds. 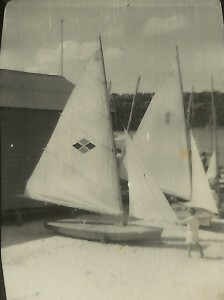 The last General Meeting held in the J. Adams Boat Shed at the Spit was on 31 January 1961. On 6 February 1961 the first General Meeting of members was held in the new clubhouse. Members present were not normally recorded in the minutes but on this very special day the minutes show members present – Messrs, Barnes, Zemanek, Skelton Snr, Nuss, B Zemanek, R Zemanek, Nugan, Hagley, Sorensen, Grainger, Perrin, Northam, Richards, J Hendry, Casper, Weaver, Bellamy, Morgan, Mear, Arcus, Dowling, Beardsmore and Maclachlan. The MHVJSC has become the MHASC, the Laser Club. 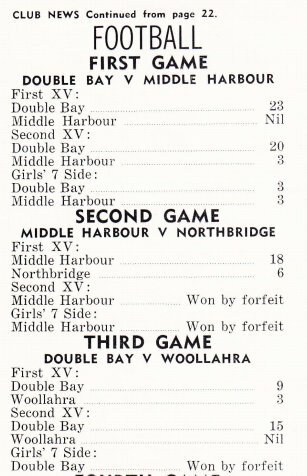 We sail from one of the best locations on Sydney Harbour and we owe so much to the club founders Barry Wilson and Brian Baker and the Presidents, Commodores, committee members, volunteers and supporters of the club. They created a leading youth sailing organisation over the late 1940s, 50s and 60s with many ‘Masters’ still sailing, they lobbied for the old ‘hoppers’ wharf on Lower Parrawi Rd, raised scarce funds and with volunteers built our clubhouse. This film was made by the Commonwealth Film Unit 1958 set at the MHVJ Club. The story of how two boys acquire a V.J. sailing boat by joining a club on the shores of Middle Harbour. The hoppers wharf prior to the new club house.